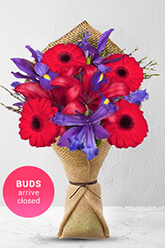 This creative, colourful bouquet of scarlet Gerberas, purple Iris and colour coordinated scarlet Asiatic Lilies is gender non specific and conveys a positive and uplifting feeling to both men and women alike.Lilies may be sent closed/partially closed in order to prevent damage and to last longer.The vase in the image is not included in the price, however for a lasting impression we recommend adding a Premium Vase to complement these gorgeous flowers. It gave me confidence to use your service and cost effective. The service was very user friendly. Thank you! Great as expected! Easy enough to order and order was delivered on the same day. Very easy to order online and got same day delivery.